To examine the validity of the segmentation scheme, we simulated a dynamic 2-[nC]thymidine (a marker of cell proliferation) PET study. 2-[nC]thymidine was chosen because it is being increasingly used in the research setting to evaluate cancer and treatment response, and it offers theoretical advantages over FDG such as greater specificity in the assessment of malignancy. Also, the kinetics are very similar for most tissues and the data are typically quite noisy. Thus, thymidine data represent a challenging example for testing the clustering algorithm. Figure 3.5: A slice of the Zubal phantom. 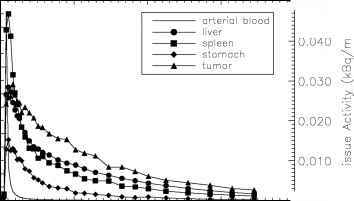 B = blood vessels; b = bone; L = liver; M = marrow; Mu = muscle; S = spleen; St = stomach; T = tumor. muscle, spleen, stomach, a large and small tumor in the liver (see Fig. 3.5). A dynamic sequence of sinograms was obtained by forward projecting the images into 3.13 mm bins on a 192 x 256 grid. Attenuation was included in the simulations for the purpose of obtaining the correct scaling of the noise. Poisson noise and blurring were added to simulate realistic sinograms. Noisy dynamic images were then reconstructed using FBP (Hann filter cut-off at the Nyquist frequency). Figure 3.6 shows the metabolite-corrected arterial blood curve and noisy 2-[11C]thymidine kinetics in some representative tissues. Figure 3.6: Simulated noisy 2-[11C]thymidine kinetics in some representative regions. A metabolite-corrected arterial blood curve, which was used to simulate 2-[11C]thymidine kinetics in different tissues, is also shown. 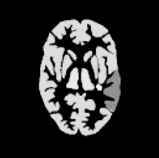 Figure 3.7: A slice of the Hoffman brain phantom. 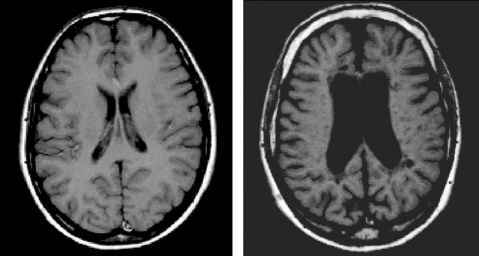 A tumor in white matter (white spot) and an adjacent hypometabolic region (shaded region) are shown. Dynamic FDG-PET study was simulated using a slice of the numerical Hoffman brain phantom  that modified using a template consisting of five different kinetics (gray matter, white matter, thalamus, tumor in white matter, and an adjacent hypometabolic region in left middle temporal gyrus), as shown in Fig. 3.7. The activities in gray matter and white matter were generated using a five-parameter three-compartment FDG model  with a measured arterial input function obtained from a patient (constant infusion of 400 MBq of FDG over 3 min). The kinetics present in the hypometabolic region, thalamus, and tumor were set to 0.7, 1.1, and 2.0 times the activity in gray matter. The kinetics were then assigned to each brain region and a dynamic sequence of sinograms (22 frames, 6 x 10 sec, 4 x 30 sec,1 x 120 sec,11 x 300 sec) was obtained by forward projecting the images into 3.13 mm bins on a 192 x 256 grid. Poisson noise and blurring were also added to simulate realistic sinograms. Dynamic images were reconstructed using FBP with Hann filter cut-off at the Nyquist frequency. The noisy FDG kinetics are shown in Fig. 3.8 and some of the kinetics are similar to each other due to the added noise and gaussian blurring, although their kinetics are different in the absence of noise and blurring. This is illustrated in the white matter and the hypometabolic region, and the gray matter and thalamus.